On May 2, 2011, the U.S. Army Corps of Engineers blew up a two-mile stretch of levee in Missouri to save the town of Cairo, Ill., from catastrophic flooding. This intentional breach opened the Birds Point-New Madrid Floodway—a 130,000-acre area of farmland—to take in some of the rushing floodwaters of the Ohio and Mississippi rivers. Within two weeks, two floodways in Louisiana, the Bonnet Carre and Morganza, were opened to lower Mississippi River flood levels from Baton Rouge to New Orleans. This marks the first time in history that all three of these floodway systems have been in operation at the same time. Natural wetlands and floodplains were our original flood protection infrastructure, and restoring more of them would help absorb and reduce floodwaters before such drastic measures as the Birds Point levee incident become necessary. Below is background on the Birds Point-New Madrid Floodway and a brief summary of this flood’s events. The Birds Point-New Madrid Floodway is a component of the Mississippi River and Tributaries Project (MR&T), the world’s largest flood control project. The MR&T project was authorized by the 1928 Flood Control Act. 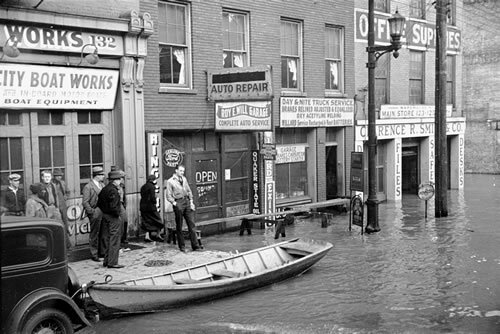 Following the catastrophic Great Mississippi Flood of 1927, there was nationwide support for a comprehensive and unified system of public works within the lower Mississippi Valley that would provide enhanced protection from floods while maintaining a channel for navigation. The Birds Point-New Madrid Floodway is one of four developed by the Army Corps of Engineers under the MR&T Project. The floodways consists of a mix of public and private lands, many of which have easements granting the corps the right to run water through. Birds Point-New Madrid Floodway is located on the west bank of the Mississippi River in southeast Missouri just below the confluence of the Ohio and Mississippi rivers. The construction and operation of the floodway was authorized by the 1928 Flood Control Act and later modified under the 1965 Flood Control Act. A floodway is a basin surrounded by levees that can be intentionally blown open to divert floodwaters. The purpose of the Birds Point-New Madrid Floodway is to lower flood stages at and upstream of Cairo, Ill., and along the east bank levee opposite of the floodway during major flood events. The floodway is approximately 35 miles in length and varies from three to 10 miles in width. The frontline (56 miles long) and setback (36 miles long) levees enclosed about 205 square miles (130,000 acres). Within the frontline levee (river side), there are two fuseplug sections that are designed and built lower than the remaining levee. After floods in the 1970s, the Mississippi River Commission revised the plan to increase operation safety and effectiveness by including two artificial crevasses in the upper fuseplug, one in the lower fuseplug and a fourth one in the frontline levee opposite Hickman, Ky. To assure the artificial crevasses came at the precise time, the use of explosives was provided. Under the current operation plan that was developed in 1986, the floodway is activated when designated sections of the frontline levee naturally overtop or are artificially crevassed through the placing and detonation of explosives. Artificial crevassing of the levee would commence upon the command of the Mississippi River Commission president prior to river stages reaching 61 feet on the Cairo gage with additional stage increases forecasted. The floodway is designed to divert 550,000 cubic feet per second (cfs) from the Mississippi River. The floodway has been used once during the Great Flood of 1937; however, most of the floodway would have been flooded as a result of natural crevasses and overtopping and backwatering through an existing 1,500-foot gap near New Madrid. There has been legal opposition to the Birds Point-New Madrid Floodway since its inception. Throughout the years, the federal government has acquired flowage and modified flowage easements that allow the government the right to operate the floodway by artificial crevassing. The easement also reserved the landowners the right to compensation if operation of the floodway resulted in “excessive deposits of sand and gravel” upon the land. On Monday, May 2, 2011, the Ohio River had risen to 61.05 feet at Cairo, bypassing the 1937 record of 59.5 feet. The river was expected to crest Wednesday at 61.5 feet and remain at that level until Friday. While the floodwall at Cairo can handle water up to 64 feet, the Army Corps was concerned about the strain the floodwaters were putting on this floodwall and in other areas. Missouri officials failed to sway a federal judge, an appeals court and U.S. Supreme Court Justice Samuel Alito, who handles emergency requests from Missouri and various other Midwest states, to block the Army Corps of Engineers from artificially breaching a two-mile section of the levee and inundating 130,000 acres of productive farmland. The decision to intentionally breach the levee was made by Major General Michael Walsh, president of the Mississippi River Commission, on May 2, 2011, at approximately 10 p.m. The decision to alleviate pressure on the levees and drawdown the Mississippi and Ohio rivers appears to have worked as planned. By 7 a.m. on Tuesday, May 3, the Ohio River at Cairo had dropped by more than a foot to 60.57 feet from 61.72 feet just before the explosion. By Tuesday night, the Ohio River at Metropolis, Ill., measured 54.7 feet, the same level at the time of the breach, but it was predicted to have a crest of more than 58 feet. The second and third levee breaches that occurred on May 3 and May 5, respectively, at the southern end of the levee complete the operation of the floodway by allowing flow back into the Mississippi River. The rush of floodwater into Birds Point inundated as many as 100 homes and washed away this year’s crop prospects. It could be late summer or early fall before the floodwaters are fully drained off the land, and the remaining sediment and moisture could do more lasting damage. The 2011 flood event is the most significant to hit the lower Mississippi River Valley since at least 1937 and has affected nine states: Ohio, Indiana, Kentucky, Illinois, Missouri, Tennessee, Arkansas, Louisiana and Mississippi. With record levels predicted for the lower Mississippi River, two additional floodways developed by the Army Corps of Engineers under the MR&T Project have been opened in Louisiana: the Bonnet Carre and Morganza. Unlike the Birds Point Floodway, these floodways are opened through a gated spillway control structure. The Bonnet Carre Floodway, which is located about 30 miles north of New Orleans, is the southernmost floodway in the MR&T. The control structure and six-mile floodway is designed to divert 250,000 cfs (or 1,870,000 gallons per second) into Lake Pontchartrain whenever the flow past New Orleans is projected to exceed 1.25 million cfs. The opening of the first gates on May 9, 2011, marked the ninth time (and the sixth time since 1973) that this structure has been used to lower river stages at New Orleans. It was used initially during the Flood of 1937. Currently, 330 of the 350 gates (or bays) are open, diverting approximately 316,000 cfs (this is more than the structure’s rated capacity). The Morganza Spillway was opened on May 14, 2011, for the first time since 1973. The Mississippi River Commission directed the corps to operate this spillway once the river flows reached 1.5 million cfs in an effort to lower flood crest levels. While it can divert up to 50 percent of the Mississippi River’s volume, only a quarter of the 250 gates are expected to be used. Currently, 16 out of 125 bays have been opened, diverting 108,000 cfs from the Mississippi through 3,000 square miles of the low-lying areas in the Atchafalaya basin to the Gulf of Mexico. Information in this statement was obtained from the Mississippi River Commission (“The Mississippi River & Tributaries Project: Birds Point-New Madrid Floodway Information Paper”; www.mvm.usace.army.mil/publicaffairs/News/press_releases/bpnm/BPNMpaper.pdf), Army Corps of Engineers Memphis District (“Birds Point-New Madrid Flood Information Sheet,” www.mvm.usace.army.mil/Readiness/bpnm/bpnminfo.asp); Associated Press; Chicago Tribune; CNN Wire Staff and MSNBC. We're going to need this on the Missouri. There's no going back to the way things were on this river (I write from South Dakota, on the Cheyenne arm). No going back means no going back to having so much water stored in the spring. The Corps of Engineers has a March 1st storage target for the river's reservoirs, it's about 57 million acre feet (maf). It's a pivotal number for the river and if you want to understand the system of dams and reservoirs we've imposed on the river you need to know the concept, at least. The Corps is supposed to strive for it, when the system is above that level. If that number is lowered there will be more room for flood waters, for the run-off of wet years. We'd be safer from the unexpected big storms like we saw in the upper basin in May. I don't know how far we should lower that number but I am sure that if we don't lower it then no one can promise the stupendous flooding of June 2011 won't happen again. Lowering the average pools would take some adjustments, there would be less water stored to go around in a drought, less hydropower, etc. If we don't lower the March 1 target, what other options do we have? Many people up and down the river have questioned why the Corps never let more water out earlier this year. And that's an option to consider. There's already a name for that option: The spring rise. It's an idea that's been around 20 years at least, to increase releases out of Gavins Point dam, mimicking natural flows to help native wildlife especially the federally endangered terns and sturgeons. It's hardly ever been implemented. It happens some years not through the dams but when lower tributaries provide a rise. Try to imagine a spring rise this year. The lower river was high this spring. Omaha was at 40,000 cubic feet per second (cfs) in March, 60,000 in April. Remember, the idea is not to help endangered species but to reduce the river's current flows, which are around 150,000 cfs. If you would cut them by 50,000 for one day today, you have to add that much to one day in March or April, (or 25,000 over two days, etc). So basically Omaha is at 100,000 cfs from March until it stops raining in the Dakotas, which it is so not doing as of June 21. That idea probably won't be popular; no wonder the spring rise has rarely been implemented. It's an idea that gets stronger when coupled with that lower March 1 storage target. We'd have more flexibility to adjust to changing river conditions. Both are simple solutions. They require no new construction, just modify the dam releases. Add in floodways as on the Mississippi and we've really got some flexibility in wet years. Want to hold a little more back behind the dams or take a chance with the spring rise? The floodways are there as outlets if needed, like relief valves. If we don't like these ideas whether alone or together, there is a fourth way: relocate people out of the floodplain. Then this flood is just one magnificent natural event we can watch in awe from the river bluffs. Those are our choices, for a system we've adapted from the natural flows of a huge river basin. If there are other choices I'd love to hear them, because what this country has done, building huge dams on the Missouri River and still suffering huge flood losses, that's just crazy.